Just like every spring for the last 19 years, Conan and friends are back. This time they face a very murderous and dark, Kaito kid, who seems to be willing to go to any lengths to steal a Van Gogh painting. What is in store for our heroes and is this villain really Kaito Kid? We shall see in the Sunflowers of Inferno which will premiere in Japan on April 18th. The films story centers on Conan as he tries to track down Kaito Kid, who is supposedly steals a replica of one of Van Gogh's Sunflowers paintings during an auction. (A real version of the painting depicted was owned by a Japanese collector, until it was destroyed during World War II. A version of the painting depicted in the movie was recently recreated.) 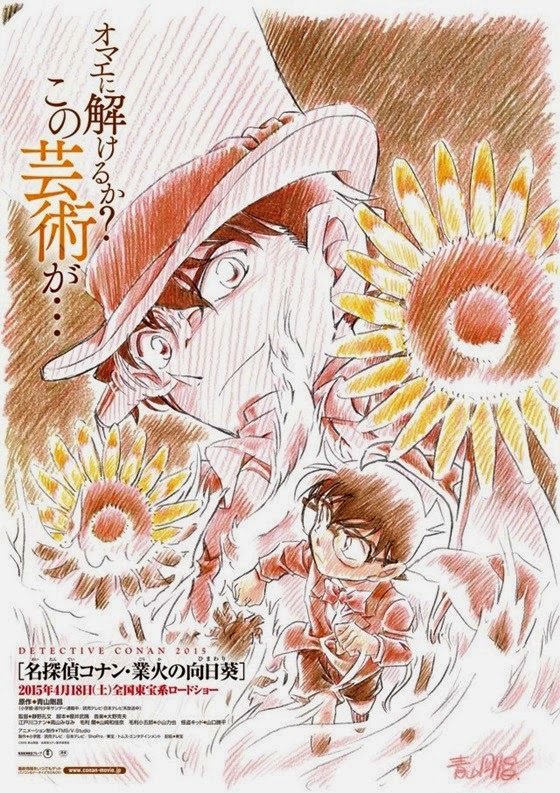 The tagline on the announcement image for the film, which was drawn by original manga creator Gosho Aoyama, reads "You will solve this? This art..."